As the title suggests, the book sets out to demonstrate to the readers and wine lovers that there is life beyond Barolo and Brunello, the most well-known Italian wines. He does not bypass the two important wines but treats them as a part of the wines in Piemonte and Tuscany respectively but does not give them any special treatment. In fact, the first chapter starts with Piemonte, the land of Barolo (and Barbaresco, if I may add) but includes his favourite Barbera, Dolcetto, Gavi, Arneis wines amongst others. While selecting the order of presentation, Hyland has chosen the regions from North to South as most wine guides do, thus ending up with Sicily and Sardegna. However, Valle d’Osta in the extreme Northwest finds itself relegated to the second place. The book describes the wines recommended by the author, succinctly and lucidly describing the wineries making the wine he has selected but not getting into the statistical or viticultural details. The book is like a Secondo Piatto where the author dives straight into the specific wines. There are no Antipasti, no Primo Piatto or Dolce. 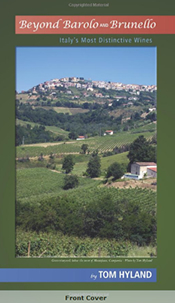 If you are looking to learn the basics of Italian wines or the regions with appellations and other statistics, this book may not be for you, though he does outline the wine grapes for each region. He has explicitly stayed away from the doc, docg, igt descriptions of the wines as he rightly claims the system has become confusing in the recent years due to political clout of various wine associations and groups. Each wine listing describes in detail several specifics about the wine, not only the aromas and flavours, but also the style of the wine as sought by the producer. More than just a technical approach to the Italian wine industry and the specific regions, he has taken an engaging look into the individual producers as they carry out the work of their previous ancestors of creating a product that reflects the terroir and a sense of place, even though the interpretation may be changing. Not surprisingly, family wineries only family wineries have been included in the book. Hyland is neither snobbish nor skeptical or sarcastic about wines from Barolo or Brunello-in fact they are simply a part of the region they belong to - Piemonte and Tuscany. Although he has chosen not to include Barbaresco in his book title, he does concede Angelo Gaja to be Italy’s most famous producer who popularized Barbaresco in the '70s and '80s. Out of a numerous popular wine labels he has picked only Gaja Sorí San Lorenzo from Barbaresco (based on its ‘89 vintage, a book with gems of technical information was published about twelve years ago). The very next entry (on page 24) is a Barolo from another icon –Bartolo Mascarello. Similarly, he clubs Massimo Ferragamo’s Castiglion del Bosco Prima Pietra, a Brunello di Montalcino with Castell del Terriccio Tassinaia and Lupicaia wines made under the supervision of Carlo Ferrini in Maremma. As the author clarifies before taking you on the wonderful wine journey, he has not listed the wines in a particular sequence. However, the alphabetical list of producers at the end makes your search easier. In this section he has also chosen to list the regions in geographic order and not alphabetical order, making it inconvenient to search every time one needs to reference a producer. It would have been much more convenient to list at least the regions in an alphabetical order, if not indexing according to the producer’s name, which is a common practice. You also discover that the number of wineries listed is related in number to the popularity of the region-though not strictly so. Basilicata (6), Calabria (4), Liguria (5) and Valle d’Osta (8) might have found an adequate mention, but Lazio (6) lovers may be slightly disappointed. At any rate, Hyland makes no apology for the number as he concedes it is not feasible to include all the wines that could be his favourite, yours or mine. As expected the maximum producers listed are from Piemonte (78) and Tuscany (96) with some producers finding a mention of two or even 3 wines. Tenuta dell’Ornellaia (importer in India: Brindco) has three wines listed- Bolgheri Superiore Ornellaia, the world famous Masseto as well as Poggio Alle Gazze Sauvignon Blanc (p 162). Michele Chiarlo (imported in India by Ace Beveragez) in Piemonte not only finds a mention for his Cerequio Barolo (p34) but also his Gavi Roverto (p3) and Barbera d’Asti Nizza Superiore ‘La Court’. Naturally, one gets to ‘taste’ the wines through his eyes and palate. For instance, Bibi Graetz (importer in India: Wine Park) in Fiesole, a beautiful suburb of Florence, is a cult producer of Testamatta (Price at Florence airport €99) but the author has selected two wines-a white wine, Bugia (p 165) and a Casamatta Rose (p 216). Similarly, he prefers Frescobaldi (importer Brindco) Chianti Rufina Riserva Montesodi (single vineyard) over Mormoreto, a rather unique wine which comes from the same estate, Castello di Nipozzano. Unlike a Bollywood movie full of song and dance sequences displaying different emotions of the hero, heroine or other protagonists, there are no such visual luxuries in the book in the form of pictures, making it a serious non-fiction, perhaps a handbook or a guidebook for an avid wine traveler looking for insights. There are 16 pictures in black and white, taken by the author personally and included with the text. The book offers an appassionato of Italian wines the opportunity to ‘drive and taste’ choice wines from all the 20 regioni (regions-like our States in India or the USA) from the northern corner of Italy to the South without getting drunk or worrying about the traffic cops stopping you, thanks to Tom Hyland. 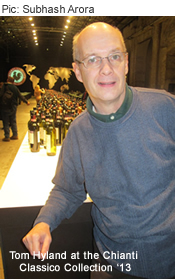 He is a Chicago-based journalist and photographer specializing in Italian wines. Tom has been travelling through the wine country extensively during the last twelve years. His articles and photos have been featured in several publications including Sommelier Journal, Decanter, The World of Fine Wine and Quarterly Review of Wines. The book is a good reference point for Italian wine connoisseurs who strive to learn more about their favourites or hitherto unknown gems.